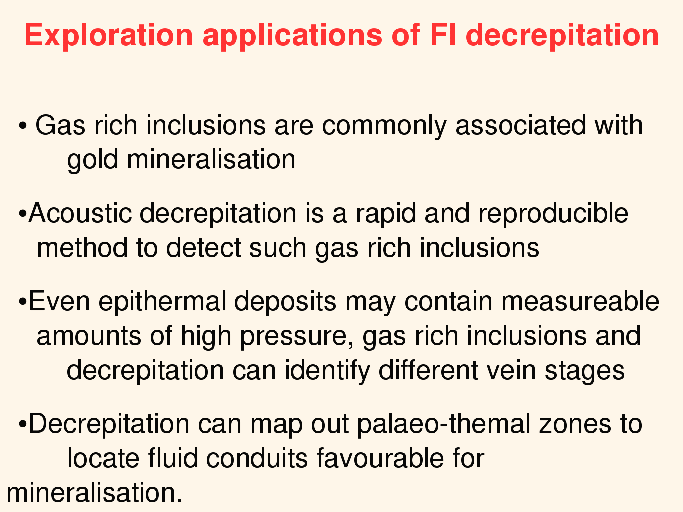 The use of fluid inclusions in exploration is frequently overlooked because conventional microthermometric measurements are slow, tedious and rarely definitive. 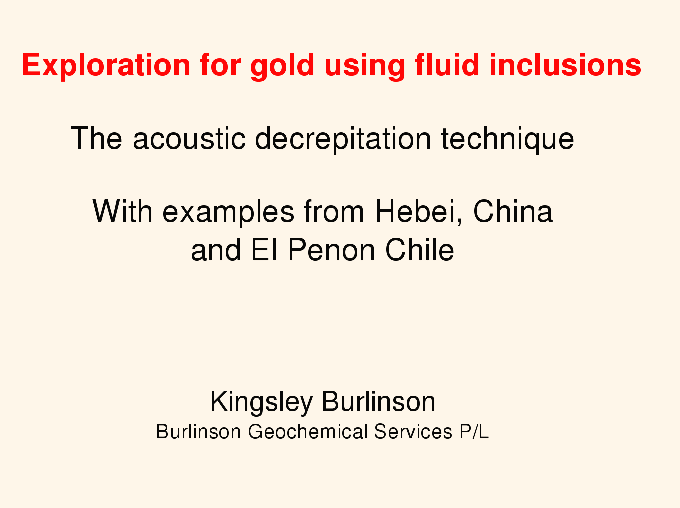 However by using acoustic decrepitation, useful exploration data can be acquired quickly and reproducibly. The results can readily identify CO2 rich inclusion fluids, in addition to providing relative temperatures of aqueous fluids to outline palaeo-thermal temperature gradients in hydrothermal quartz systems. 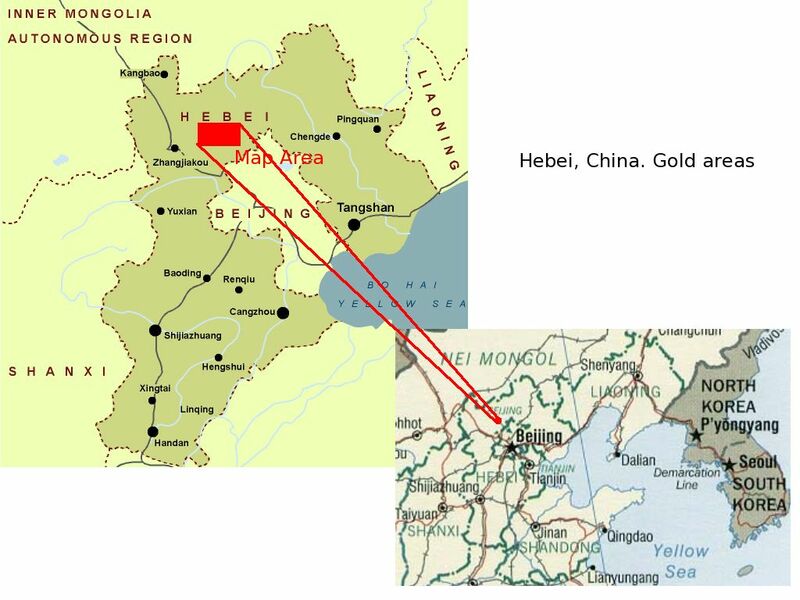 Samples from several gold mines in the Hebei province of China show that CO2 rich fluids are quite rare in this region, in contrast with the common occurrence of very CO2 rich fluids in typical archaean gold deposits. 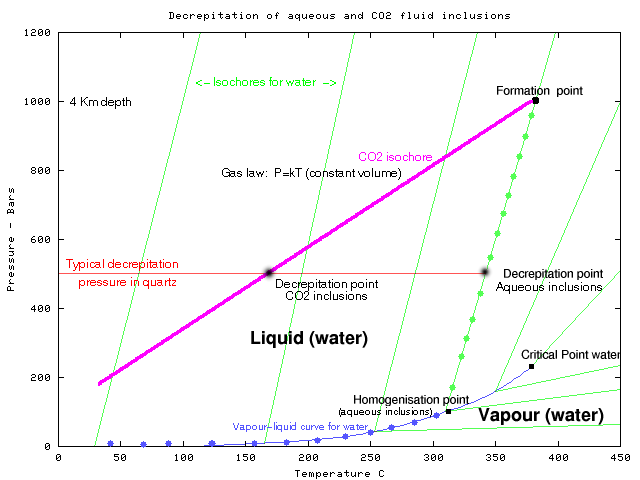 Because the microscopic studies on these deposits concentrated on the rare but prominent CO2 rich inclusions, the deposits have been wrongly classified as being derived from CO2 rich fluids, wheras acoustic decrepitation shows that those CO2 rich fluids were merely minor phases of the overall hydrothermal system. 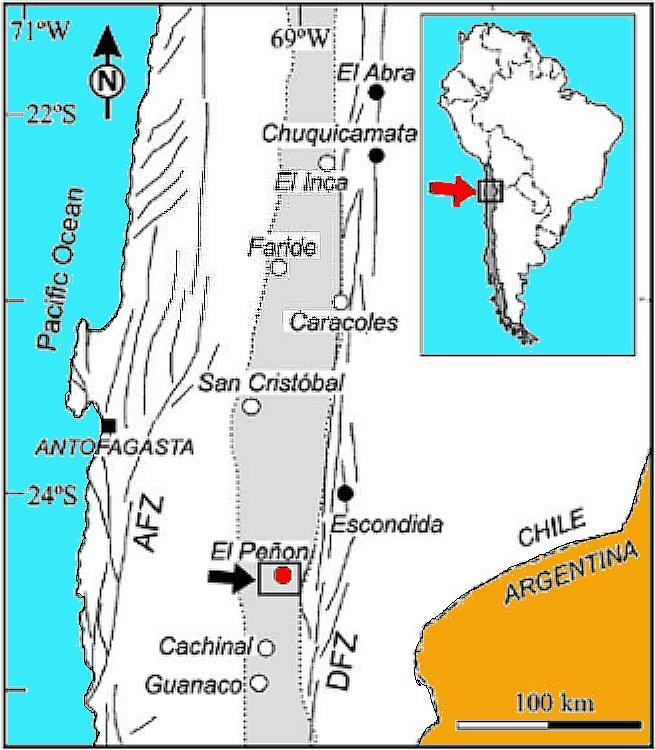 At the El Penon epithermal gold deposit in Chile, there are some CO2 rich fluids present, indicating a deeper and higher pressure origin than is usual for epithermal deposits. Variations in the aqueous fluid temperatures of about 50 C suggest that mapping of paleo-thermal gradients can be done, which may help to outline favourable mineralised zones within the quartz system. 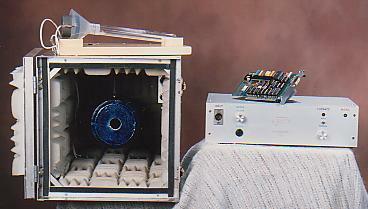 The BGS model 105 decrepitometer is a completely automated digital instrument whiich works together with a desktop computer. Previous decrepitation efforts failed to understand critical issues. The fluid inclusion decrepitation method was first used in the 1940's as a method to measure homogenisation temperatures. The method was soon replaced by microthermometry which was recognized as being more accurate for determining these temperatures. 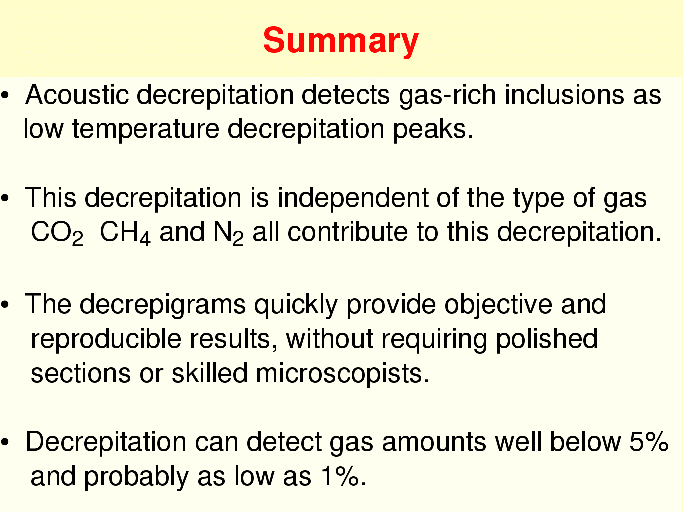 However, it was not understood that much of this early decrepitation work was subject to interference caused by the presence of CO2 rich fluid inclusions. Consequently much of the criticism of the technique, which led to its demise for academic research purposes, is now known to be inappropriate. The technique was subsequently used in Russia and China in the 1970's in exploration programmes, in which economical and rapid analyses are more important than modest inaccuracies. 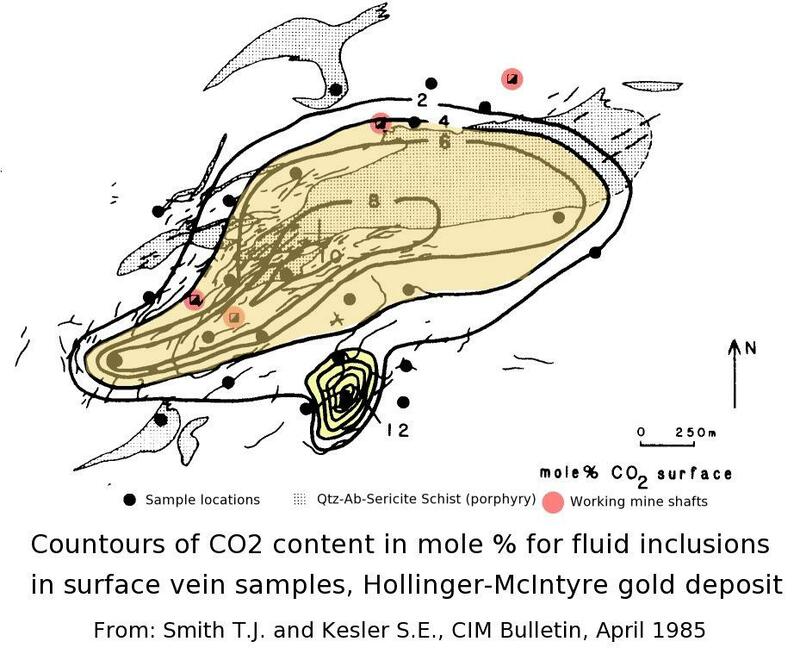 However, even this work failed to recognize the importance of the effects caused by the presence of CO2 rich inclusions. 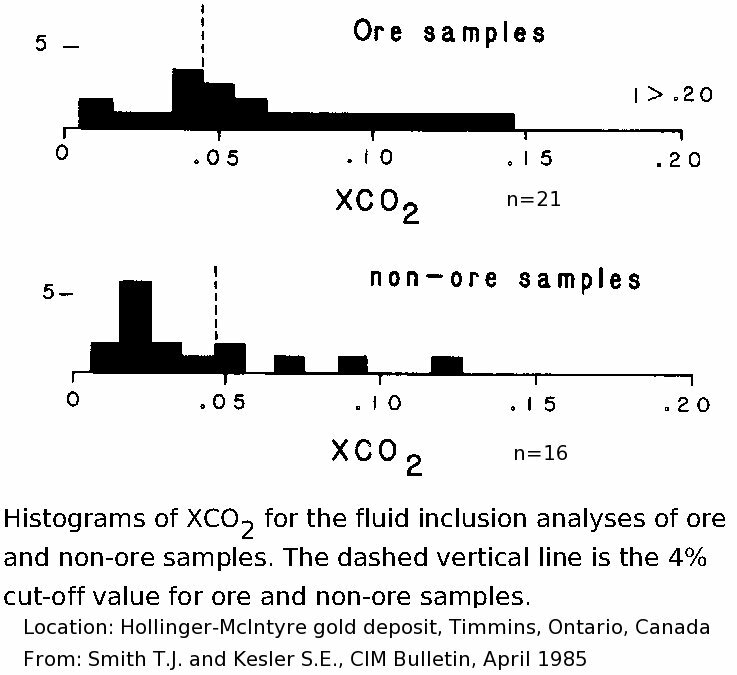 It was not until 1983 (Burlinson, K., 1984) that the effect of CO2 rich fluid inclusions upon decrepitation data was recognized. 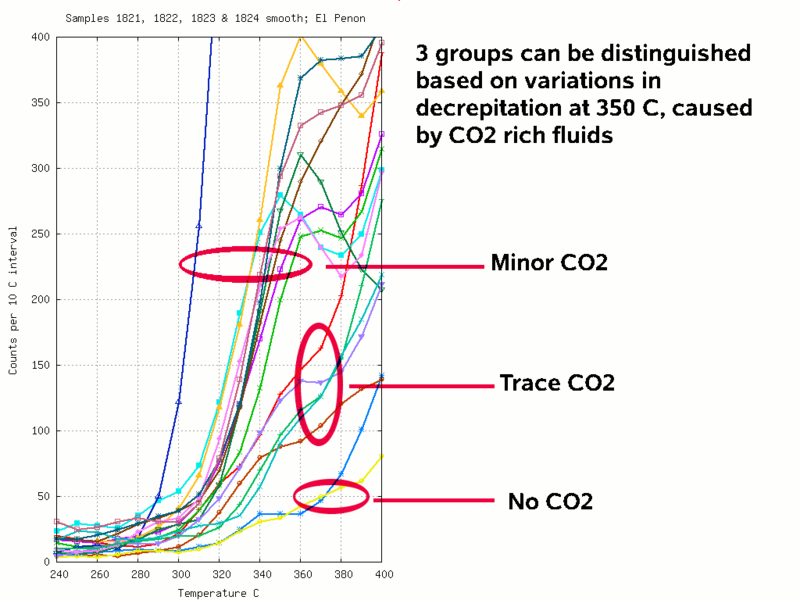 Such CO2 rich fluid inclusions develop high internal pressures at low temperatures resulting in decrepitation long before the inclusion reaches homogenisation temperature. 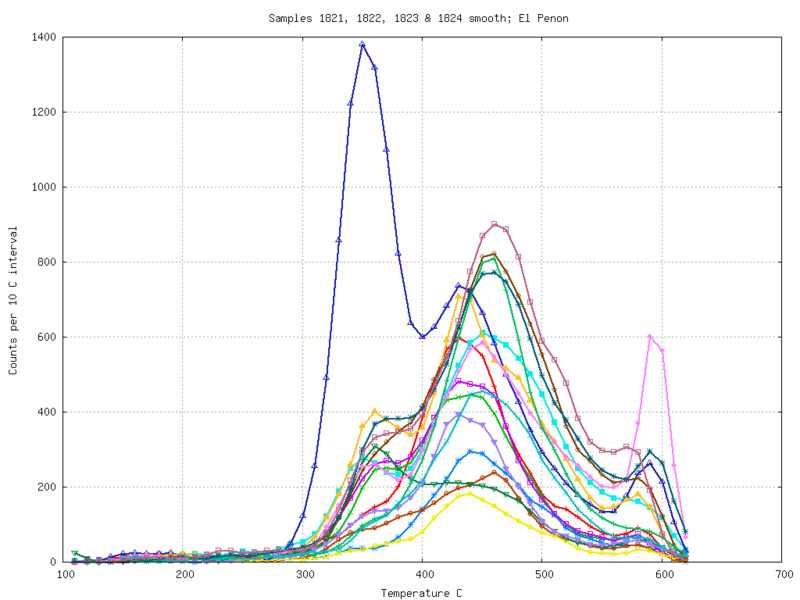 This behaviour is frequently observed in microthermometric studies where it is a major problem when trying to measure the homogenisation temperature. 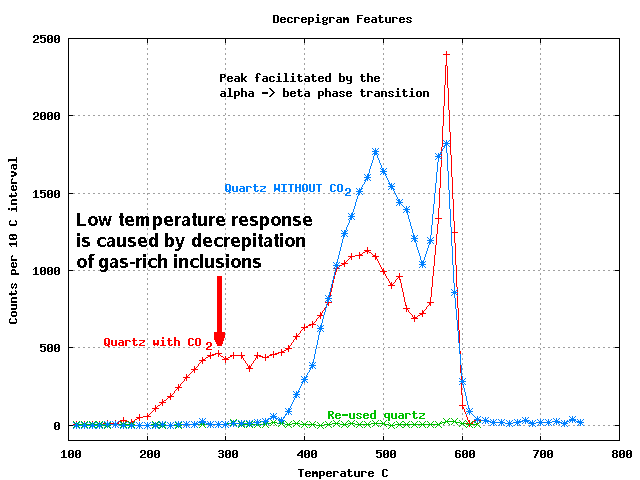 However, this decrepitation gives rise to distinctive low temperature peaks on the acoustic decrepigrams which can be used to recognise the presence of CO2 rich fluid inclusions. This led to the recognition that CO2 measurements by acoustic decrepitation could be used as an exploration technique for Au deposits as they are often associated with CO2 rich hydrothermal fluids. 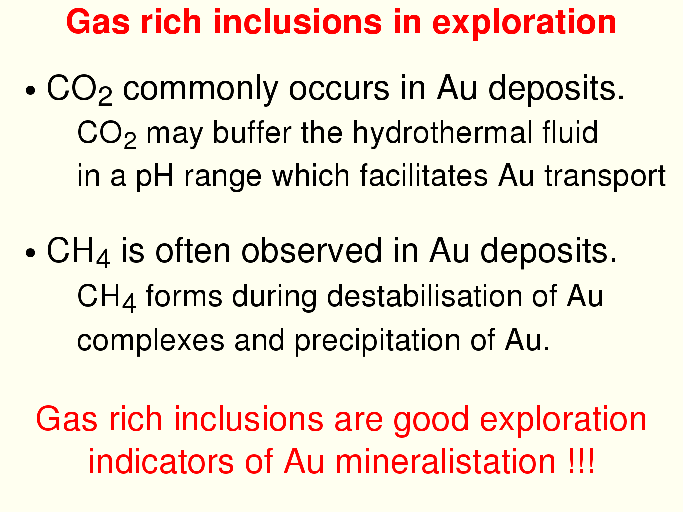 Many workers have noted a common association between gold mineralisation and CO2 rich forming fluids, although this relationship is indirect and due to the buffering of the fluid pH in a range which enhances the solubility of complexes of gold with reduced sulphur (Phillips, G.N. & Evans, K.A., 2004). 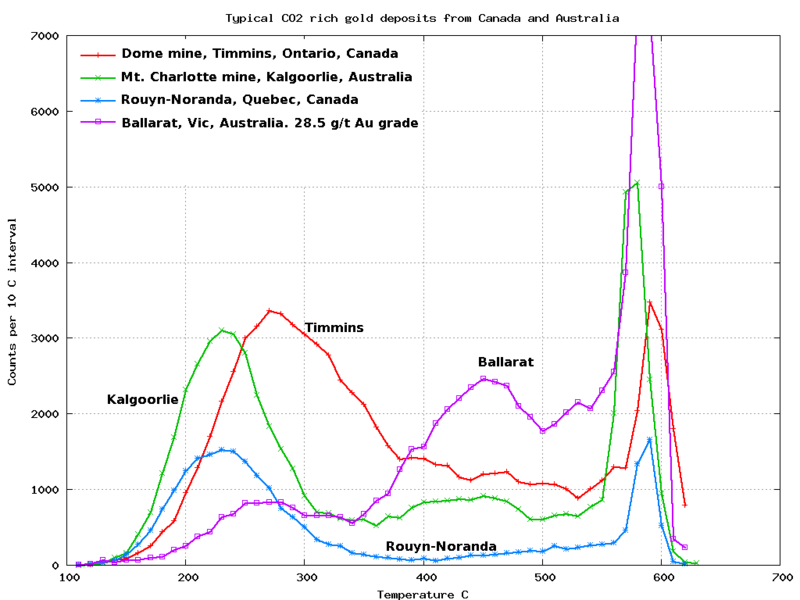 CO2 rich fluids are common in many gold deposit styles, particularly the archaean deposits in the Canadian Abitibi province and the West Australian Yilgarn province, as well as the turbidite hosted gold deposits in Victoria, Australia, and Nova Scotia, Canada. 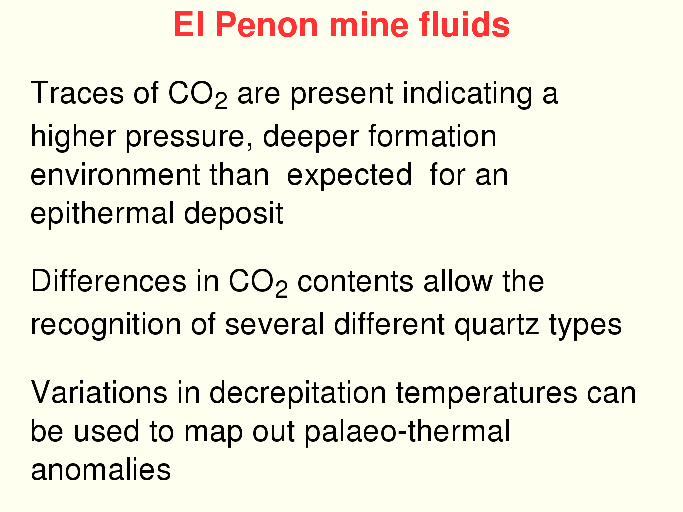 In deposits formed at shallow depth, such as epithermal deposits, most of the CO2 is exsolved from the fluid before inclusion trapping occurs. Such inclusions have low internal pressures and lack a low temperature acoustic decrepitation peak. The decrepitation observed is from dominantly aqueous inclusions and reflects the temperature of the deposition from these fluids. Variations in this temperature can be used to map out temperature gradients within the hydrothermal system as a means of identifying zones of quartz of economic interest. 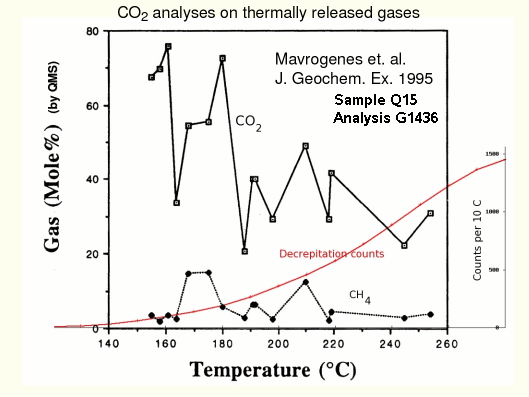 Confirmation of the relationship between low temperature decrepitation and CO2 rich fluids was provided by Mavrogenes et al. 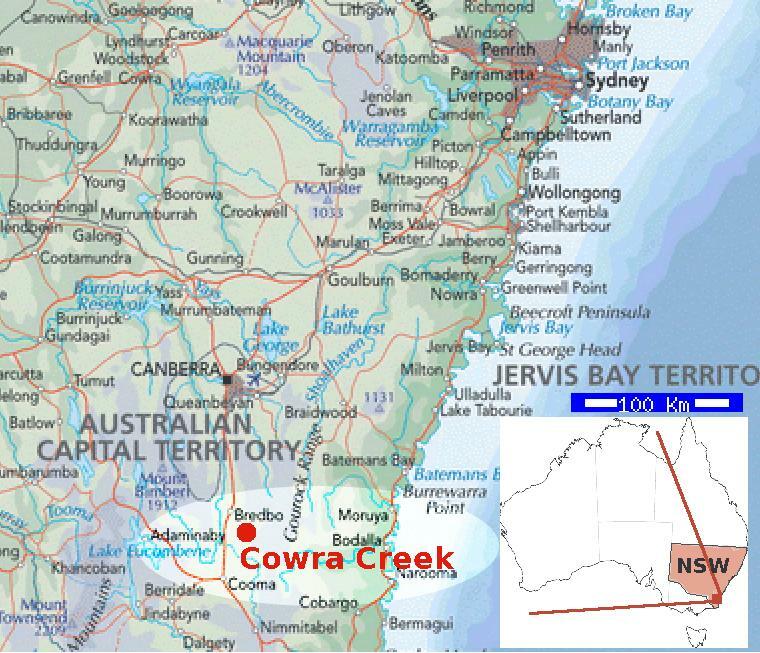 (1995), who performed quadrupole mass spectrometric analyses of gases released from fluid inclusions from samples from the Cowra Creek goldfield in NSW, Australia. 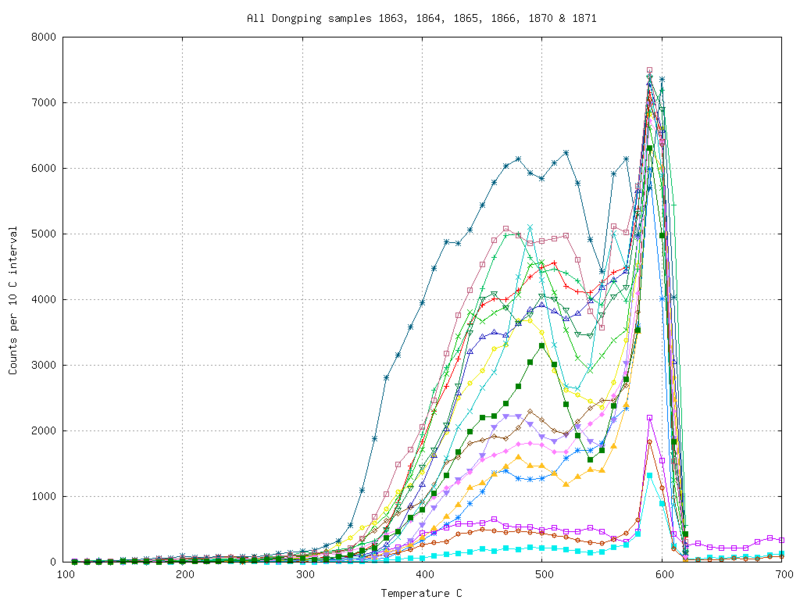 In this work, 5 samples with prominent low temperature acoustic decrepitation peaks were shown to give rise to CO2 rich gases when the fluid inclusions were opened either by sequential heating or mechanical crushing of the same samples. 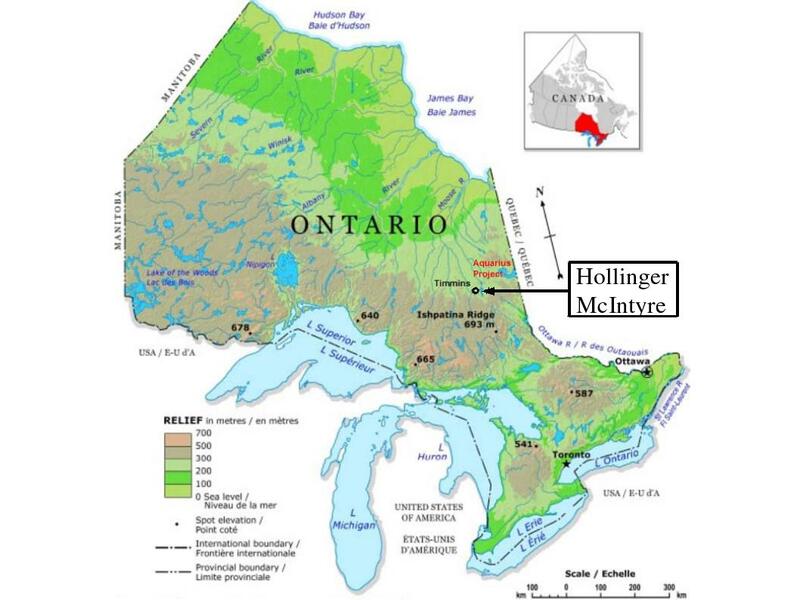 A detailed study of the Timmins, Ontario region (Smith, T.J. & Kessler, S.E., 1985) has documented the relationship between CO2 levels and the potential for Au mineralisation in that region, showing its use as a regional exploration indicator. 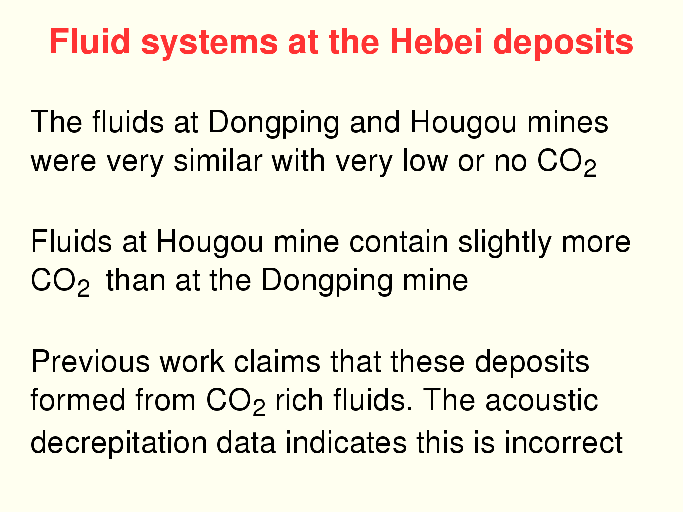 Figure 2 shows typical decrepitation results from these types of deposits and the CO2 rich fluids are evident from the prominent acoustic decrepitation peaks below 300 C.
39 samples were collected from 3 mines in the Hebei province. 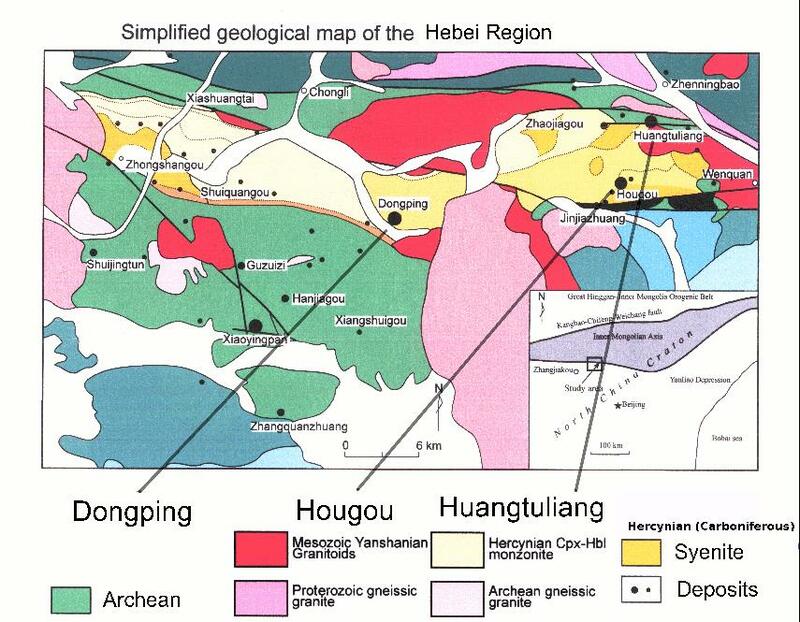 These are from intrusion related gold deposits in structurally controlled zones, but despite the involvement of deep-seated fluids, only trace amounts of low temperature decrepitation due to CO2 rich fluids were found in the Hougou mine, and no such CO2 rich fluids were identified in the Dongping or Huangtuliang mines. 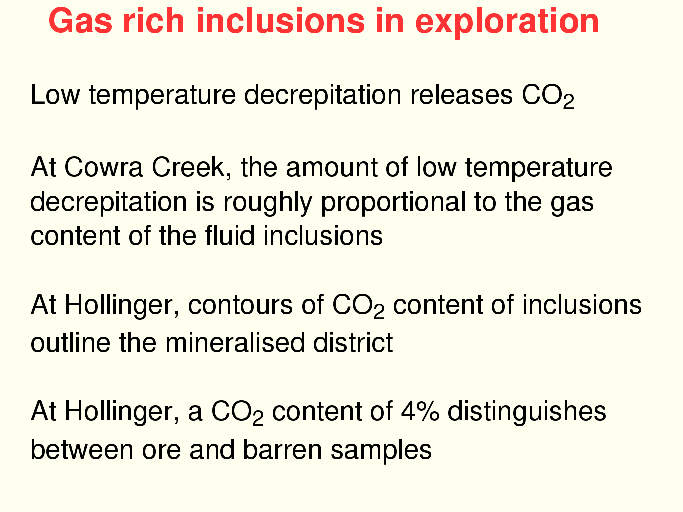 Although other studies, using microthermometry, have suggested the formational fluids at these mines were CO2 rich, the acoustic decrepitation data show that such CO2 rich fluids were volumetrically insignificant and they may not be the source of the gold mineralisation at all. 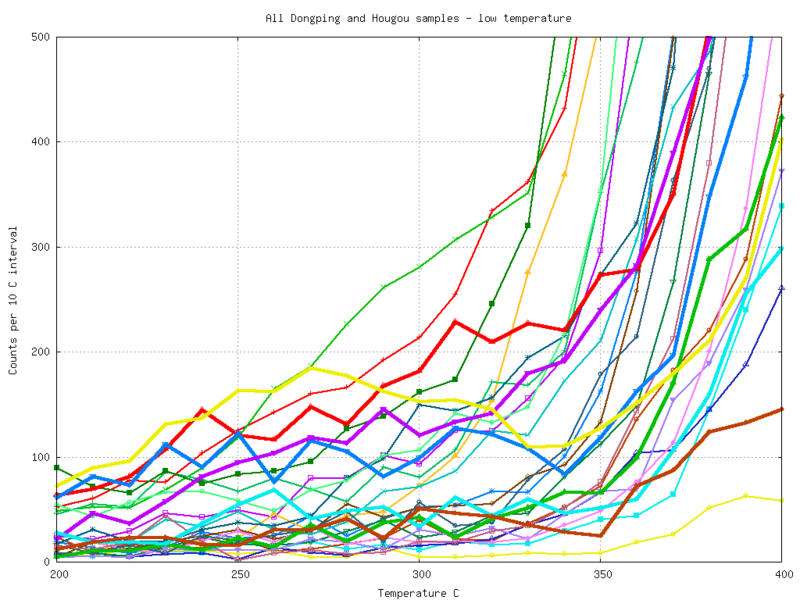 At the Dongping mine there is almost no low temperature decrepitation and hence no significant CO2 in the fluid system. At the Hougou mine there is slight decrepitation at low temperatures indicating minor amounts of CO2 in the fluid system. 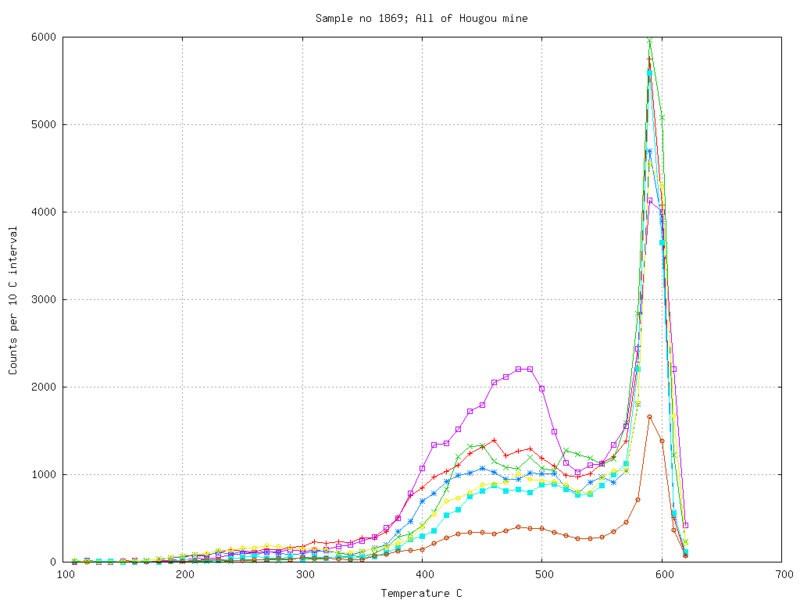 Comparing the Dongping and Hougou sample decrepitation at low temperatures we see that the Hougou mine samples (thicker lines) tend to have more low temperature CO2 caused decrepitation than the Dongping samples. 20 samples were collected from the ore and waste dumps at this mine, as underground access was not possible. Of these, 12 samples showed a low temperature decrepitation peak at about 350 C, which indicates the presence of CO2 rich inclusions. The higher than usual decrepitation temperature indicates that the inclusions had lower internal pressures than found in typical archaean gold deposits. Although this deposit is stated to be epithermal in origin, the presence of CO2 rich inclusions indicates a formation depth much greater than usual. 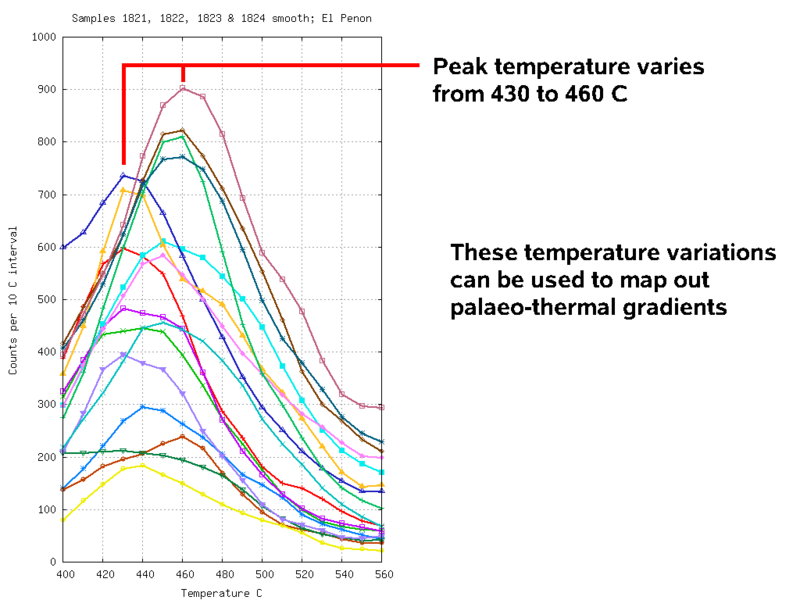 The decrepitation temperature of the main peak in these samples varies from 430 C to 460 C showing that there are small temperature differences within the quartz, from which it may be possible to map out palaeo-thermal zones within the quartz, given proper spatially located samples. 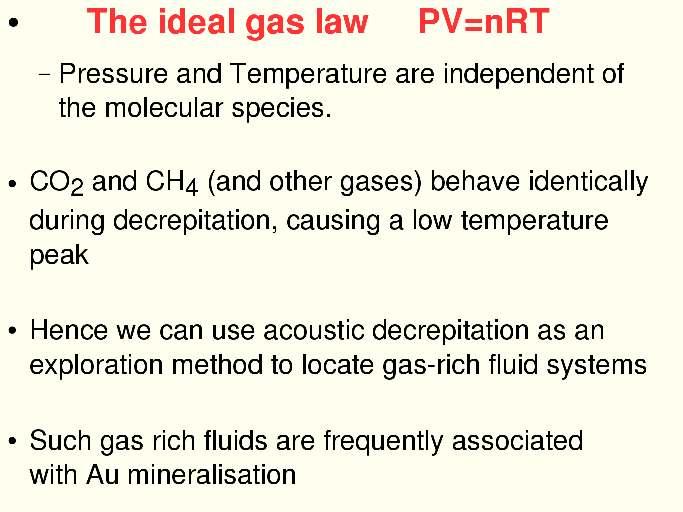 Acoustic decrepitation is able to detect the presence of CO2 rich fluid inclusions, due to their high internal pressures, which results in premature decrepitation at low temperatures when heated. 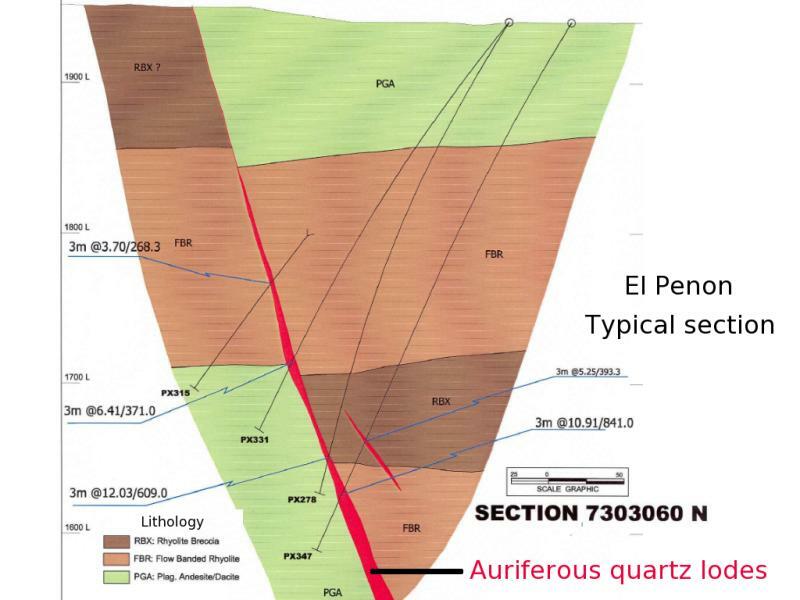 As CO2 rich fluids have frequently been shown to be associated with gold mineralisation in many districts, this means we can use decrepitation to quickly scan large numbers of samples as an exploration method to look for potentially mineralised quartz and to discriminate between quartz samples which are visually indistinguishable. 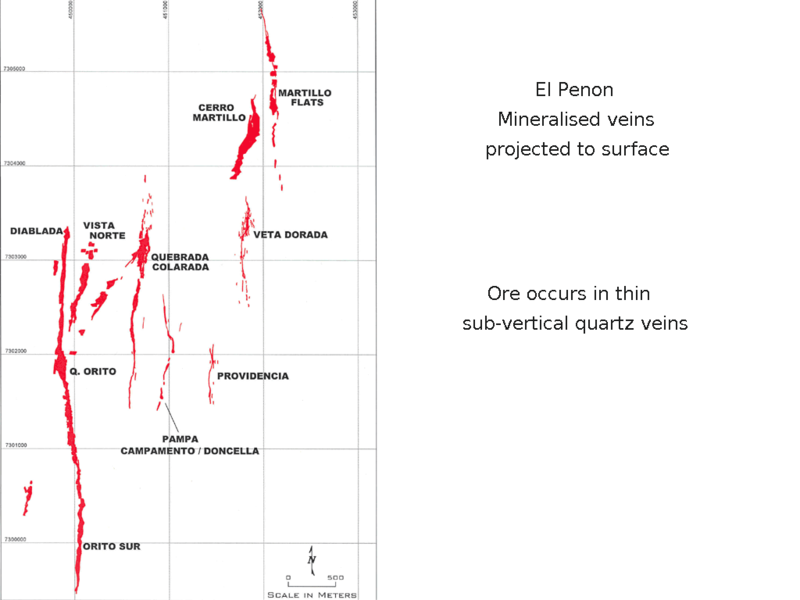 In addition, temperature variations of primary fluid inclusions can be used to generate palaeo-thermal maps, which can be used to identify potentially mineralised zones within quartz veins and vein systems. Fluid inclusion information is potentially very useful in exploration, but its use has been very limited to date because collection of the information is tedious, inconvenient and expensive. 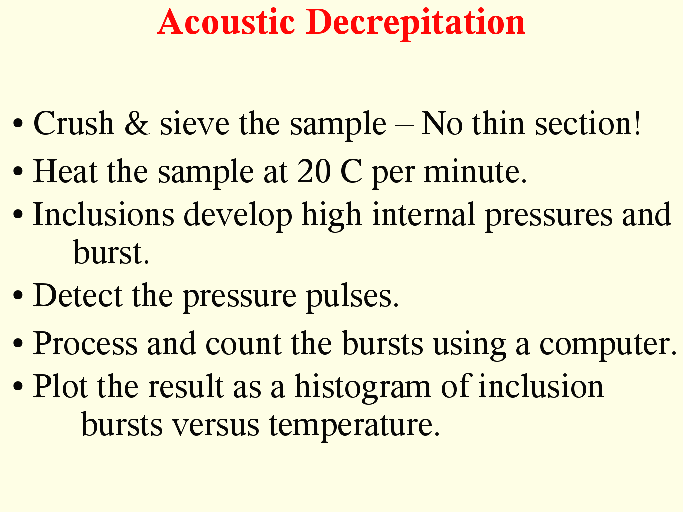 The acoustic decrepitation method overcomes these limitations and provides data which is very useful in exploration, despite its accuracy being less than that from traditional microthermometric methods.